What's the secret ingredient that adds that rich, flavorful, meaty taste to your soups, sauces, and gravy? Why, Campbells Beef Broth, of course! You can use this delicious beef stock to improve your recipes, or just heat it up right out of the can for a healthy, tasty hot meal that will help you beat that cold in no time. Kids and adults adore Campbell's canned goods! 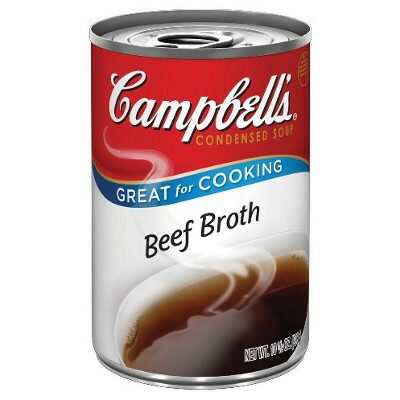 Beef stock, yeast extract, less than 2% of: salt, flavor enhancer E621, flavoring, dextrose, color E150, yeast extract, beef flavor (beef stock, yeast extract), hydrolyzed soy protein, water, hydrolyzed wheat gluten. Contains GMO. Nutrition facts (for 100ml): calories 13Kcal, total fat 0g (saturated fat 0g), total carbohydrate 0.8g (sugar 0.8g), protein 1.7g, salt 1.8g.